Worldwide smartphone shipments are expected to surpass the 1 billion unit mark in 2013, representing a 39.3 per cent growth over 2012. In addition, by 2017, total smartphone shipments are expected to approach 1.7 billion units, resulting in a compound annual growth rate (CAGR) of 18.4 per cent from 2013 to 2017, according to a report by International Data Corporation (IDC). Not surprisingly, the Asia Pacific region alone has a 52.3 per cent market share (and accounts for over half of the total smartphone shipments), followed by Europe and North America that account for only 18 and 15 per cent respectively. From a volume perspective, emerging markets including Asia Pacific, Latin America, and Middle East and Africa (MEA) will all post market-beating growth rates from 2013 to 2017. According to the IDC's forecasts, by 2017, Asia Pacific's market share will further increase to 58.3 per cent, while Europe and North America's share will decrease to 15.5 and 11.2 per cent, respectively (see table below). Although developed markets will see market share erosion, they will nonetheless see volume increases during the same time period. Despite a number of mature markets nearing smartphone saturation, the demand for low-cost computing in emerging markets continues to drive the smartphone market forward. 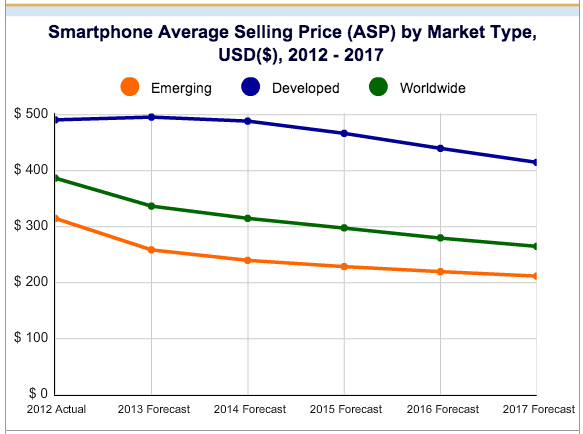 And while a number of trends co-exist in the global smartphone market, none has more of an affect on driving market growth than the steady decline in average selling prices (ASPs). "The game has changed quite drastically due to the decline in smartphone ASPs. Just a few years back the industry was talking about the next billion people to connect, and it was assumed the majority of these people would do so by way of the feature phone. Given the trajectory of ASPs, smartphones are now a very realistic option to connect those billion users," said Ryan Reith, program director with IDC's worldwide quarterly mobile phone tracker. In 2013, IDC expects smartphone ASPs to be $337 (Rs 21,049), down 12.8 per cent from $387 (Rs 24,172) in 2012. This trend will continue in the years to come and IDC expects smartphone ASPs to gradually drop to $265 (Rs 16,552) by 2017. ASPs in the emerging markets will post single-digit CAGR declines from 2013 to 2017, led by Asia/Pacific (see table below). This will enable more users to afford smartphones for the first time, and in many cases, allow users to bypass purchasing feature phones altogether and go straight to smartphones. "The key driver behind smartphone volumes in the years ahead is the expected decrease in prices. Particularly within emerging markets, where price sensitivity and elasticity are so important, prices will come down for smartphones to move beyond the urban elite and into the hands of mass market users. Every vendor is closely eyeing how far down they can price their devices while still realising a profit," said Ramon Llamas, research manager with IDC's mobile phone team. The Android operating system has enabled a number of new manufacturers to enter the smartphone market and many of these handset vendors have focused on low-cost devices as a way to build brand awareness. In India, while big guys like Samsung and Nokia still dominated the market, their share has been steadily dropping, mainly driven by intense competition from local vendors. Among the local vendors, most of the larger ones (like Micromax, Karbonn, Intex and Lava, etc.) have successfully transitioned their lead in feature phones to smartphones. In fact, they accounted for over half of the total smartphone market in the second quarter of 2013. In addition, according to a report released by CyberMedia Research (CMR), India's overall handset shipments in the third quarter of 2013 (July-Sept 2013) crossed the 69.2 million unit mark, recording a year-on-year growth of 10.9 per cent. While the smartphones segment recorded a 152 per cent Y-o-Y growth, the feature phone segment witnessed its first ever negative Y-o-Y growth of 0.8 per cent in the Indian mobile handset market.